Welcome to Axios Codebook, the cybersecurity newsletter with strong opinions about different brands of mineral water. Tips? Please reply to this newsletter. The World Cup begins today in Russia. And while Codebook can't give you any sporting predictions (despite a year as a backup on the JV2 soccer team), we can predict what World Cup hacking will look like. 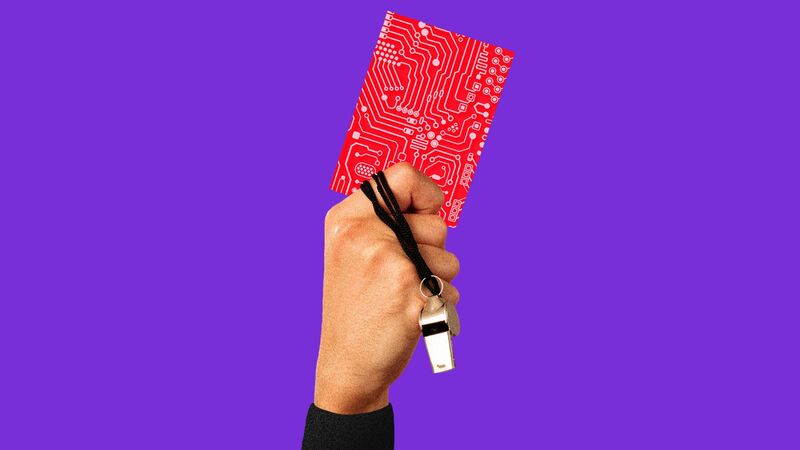 Hackers are watching the games: In prior years, Cybersecurity firm Akamai has seen declines in cyberattacks while the World Cup games are in play — "at least until games are out of reach," said Patrick Sullivan, Akamai director of security technology. Akamai specializes in the types of attacks involving the flow of internet traffic, making those types of attacks the ones the company has the most insight into. Nations: Some recent Olympics have been marred by destructive nation-led attacks, including attacks against the World Anti-Doping Association and wide-spread malware attacks. However, it appears World Cup host nation Russia was behind the brunt of these assaults, with occasional ducks behind fake personas like "Anonymous Poland." The counter move: The Journal cites a White House official who says the administration will try to get the ZTE language softened when the House and Senate compromise on a final version of the National Defense Authorization Act. White House deputy press secretary Hogan Gidey said in a statement that the administration would press Congress to back off. If no deal is reached: For seven years, ZTE wouldn't be able to use American components that the company can't do without. But lawmakers are concerned that ZTE has been twice caught selling banned technology to North Korea and Iran, and — like its Chinese rival Huawei — has been accused of sabotaging its own equipment to let Chinese intelligence spy on communications networks. The only reason Huawei is the second-largest smartphone maker in the world and ZTE the fourth though is because we’ve let them run wild for too long. We’ve given them access to our markets even as they’ve broken our laws and abused the rights of our citizens. But if we refuse to do business with them, things would change very quickly, believe me. ZTE proposed a $10.7 billion financing plan Wednesday to weather the storm. Law enforcement officials are upset with Apple's plan to fix a security bug police used to break into phones, according to a New York Times report Wednesday. The details: The lightning port on the iPhone - the one used to charge the phone - can also transfer data. Police had used that feature to access locked cell phones. Apple will now cut off data transfer after an hour — a plan first reported by Motherboard. What they're saying: “If we go back to the situation where we again don’t have access, now we know directly all the evidence we’ve lost and all the kids we can’t put into a position of safety,” Chuck Cohen, the head of an Indiana State Police task force crimes against children, told the Times. The nuance: There is no such thing as a law enforcement-only security defect. Allowing the police to continue to use the bug now widely reported on in the press would also mean acccepting that criminals would be able to do the same thing. Mexican presidential candidate Ricardo Anaya claimed a website meant to cut into frontrunner Andres Manuel Lopez Obrador's lead was hit by a denial of service attack, rendering it inoperable. The details: Anaya held up a sign pointing viewers to a website about Lopez Obrador during a debate, but the site was down before viewers were able to see it. Distributed denial of service attacks (DDoS) flood a site with so much traffic that the site bcomes inaccessible. Be smart: That certainly could have happened — but DDoS attacks of that and larger scopes are not difficult to pull off by a single angry person. If it was a DDoS — still just a claim at this point — it could have been run off of free software available online, or any of a number of rent-a-DDoS services. The fact that "attacks [came] mainly from Russia and China" doesn't actually mean anything. A DDoS uses hacked systems — often internet-connected devices, like cameras. The location of those devices doesn't correlate to the attacker's whereabouts. The European Union will now discourage governments from using Kaspersky Lab products, after the EU Parliament passed a non-binding measure Wednesday to cease use of the company's products. Kaspersky Lab's antivirus tools have been accused of masking Russian spying operations — something that Kaspersky has denied. Why it matters: More than in the U.S., which passed a binding ban last year, there are significant consequences to the EU ban. The company had an agreement to assist Europol in investigations. Kaspersky told Cyberscoop that deal is now off.